Ms. Lubna has completed her bachelor’s degree in Clinical Nutrition and Dietetics from College of Health Sciences, University of Sharjah (2016) and she has completed a course in Diet and Weight Management (2015). 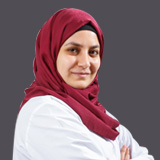 She is trained in Clinical field in Al- Qassimi Hospital – Sharjah (2015) and Rashid Hospital – Dubai (2016). She also has training in Food Services and Management in American Private Hospital – Dubai (2016). 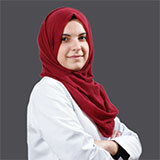 Ms. Lubna has received post – graduation internship in University Hospital – Sharjah (2016 – 2017). Ms. Lubna practiced as a clinical dietitian in nutrition assessment, evaluation and intervention for each case such as diabetes, hypertension, kidney diseases, heart diseases, cancer, obesity, gastrointestinal problems, pregnancy and lactation for about one year.